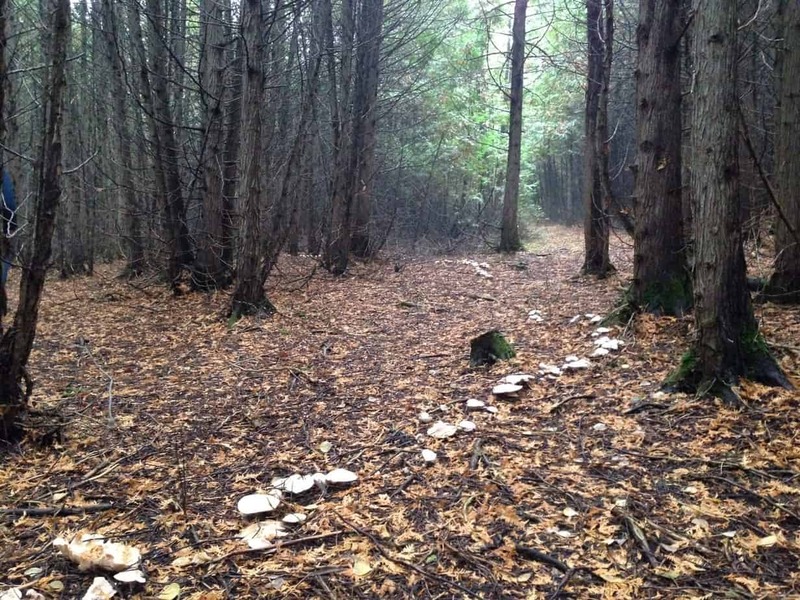 I actually think I saw the very same mushroom “trail” at the Eco Park this fall–not too far in and, if I remember correctly, just past the boardwalk or over in that direction somewhere. At that time (Sept? Oct?) there were quite a few other common mushrooms around as well. The “trail” is a good size as these things go. I took it to be a fairy ring. You can see the curvature in the line up as Alan wanders through his video.Hard to judge species as there are several whitish species that form fairy rings. These were a good size, certainly including caps in the 4″ range, but I didn’t bother to document it. Also hard to know diameter of the circle due to terrain and impossible to establish the original center of the ring due to successive tree harvests on that property. All the mushrooms would be coming from the same parent mycelium.and the mycelium ring would have worked its way outward over many years as nutrients close in were exhausted. The fairy ring I know best at Mark S. Burnham Provincial Park reliably fruits every year, so maybe this one does too and we can pay more attention next year to see if it is truly exceptional (>10 meter diameter).